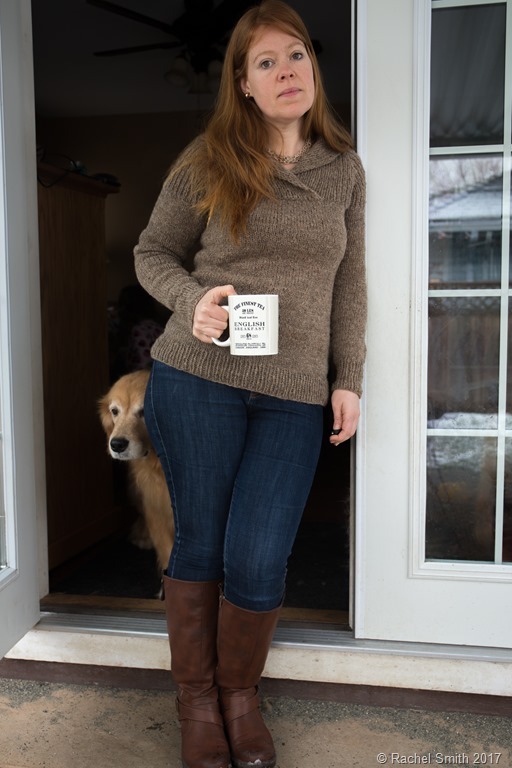 There are some projects that seem to come together, regardless of what happens along the way: Old lanolin on the yarn, reknitting pretty much EVERY piece of this sweater twice, worries about fit. They seemed to just resolve themselves as the project progressed. You may remember, if you are a long time reader, that this sweater spin was finished during Spinzilla 2016. I spun the 2lbs that I had in my stash, intentionally for the Fireside pullover. 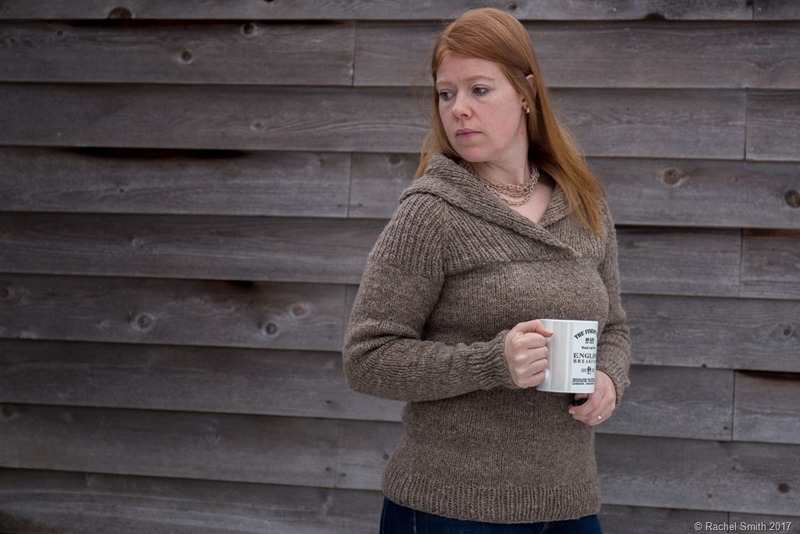 This is the first time that, for a sweater, I haven’t swayed in my resolve to create a specific item from specific fibre – from start to finish, I knew that this wanted to be, including the colour. 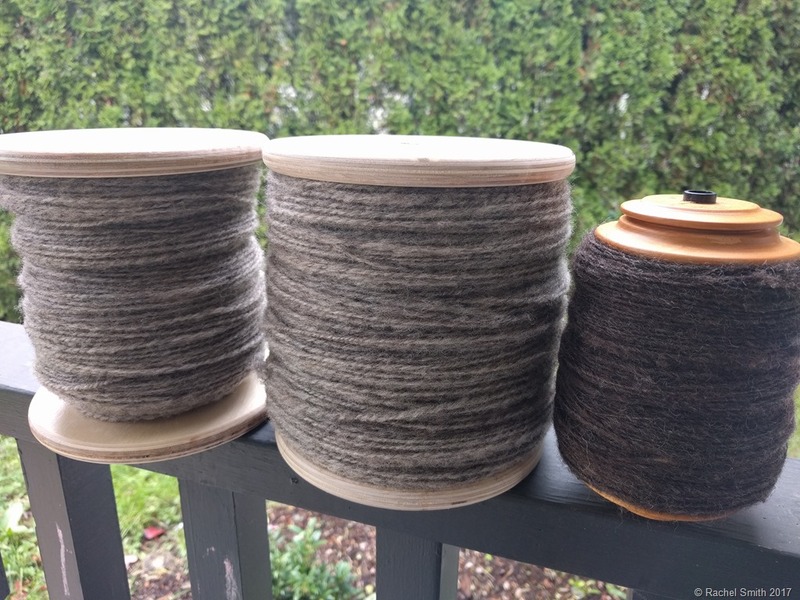 The yarn was spun almost exclusively throughout the crazy intense week that is Spinzilla – I spoke about the week and my results on Episode 41 and recapped here if you are interested in learning more. The yarn was beautiful when finished and I was torn about overdyeing it with Black Walnut, which I had planned from the beginning. 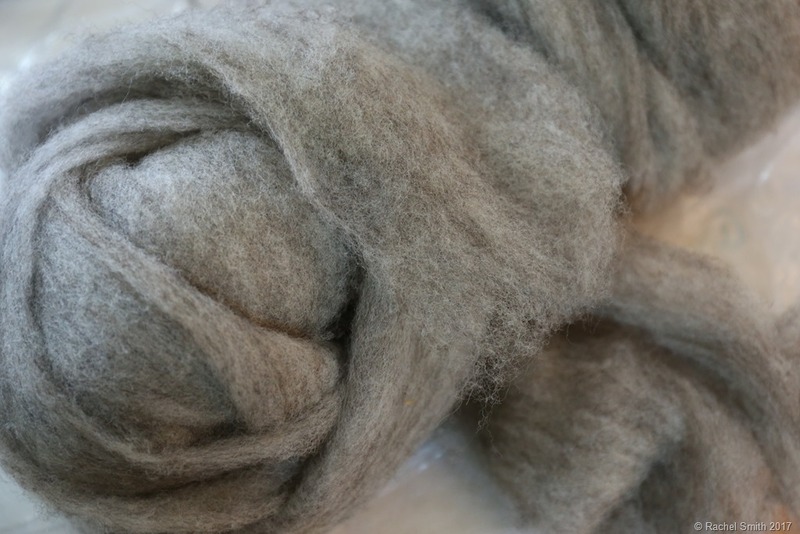 In the end, I decided to go ahead since there is an infinite supply of natural grey fleeces in the world. I thought, worst case, if I still wanted a grey sweater afterwards, I could definitely spin for another one! 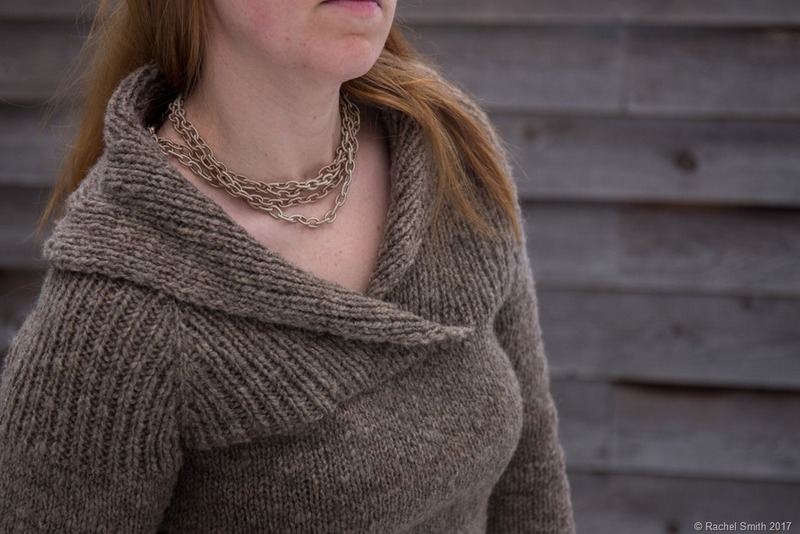 And I already have some Dorest Suffolk cross in my stash to work on next … for a grey sweater this time. 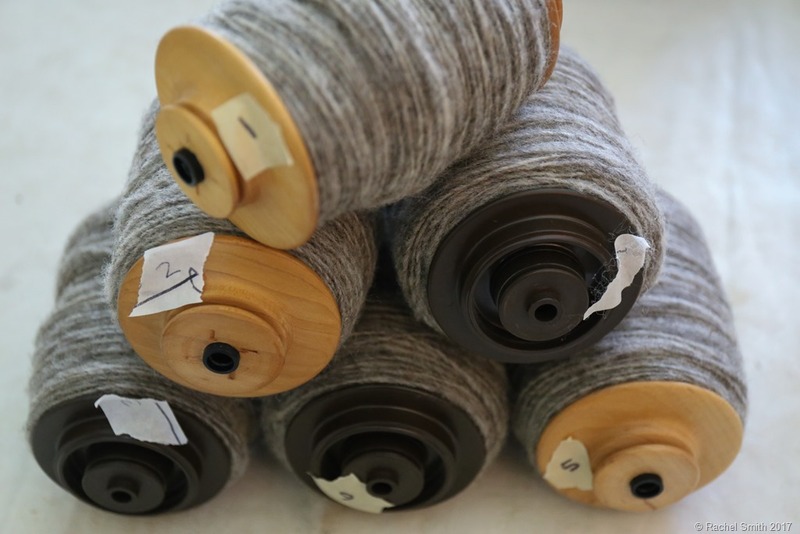 Above: 32 ounce SpinOlution bobbins, freshly plied next to a standard 4ounce Schacht bobbin. Prior to winding off. 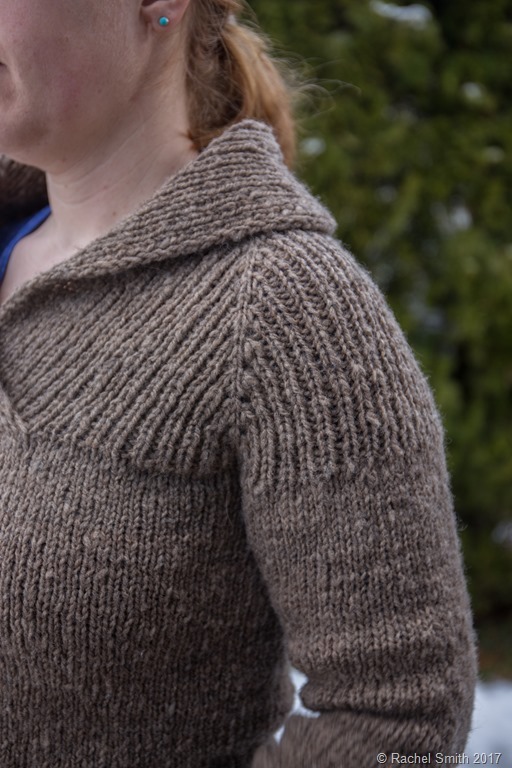 Total yardage in the end was 1060yards of Aran weight. The knitting began in early November and immediately, I knew there was a problem with the yarn. Thanks to some help with viewers of the show, I figured out that it was old lanolin on the fibre that had probably hardened during the dyeing process, rather than being removed. It made for a very difficult knitting experience – next time, I would re-wash and scour the yarn prior to starting the knitting but by the time I figured out the problem, I was too far into the project to stop. I decided, with guidance from a very helpful Ravelry friend, to finish knitting and gently scour afterwards. In the end, this is exactly what I did and thank goodness! It worked like a hot damn. The resulting sweater is softer than previous, which I’m not sure why but I wasn’t expecting. The most interesting thing about the washing and scouring process for me was that the yarn evened out incredibly. There are still the signature stitches that look woollen spun but from a distance, it appears much more uniform. The collar is large and oversized. It looks wonderfully flattering, I think. I’m looking forward to finding and pairing different things from my wardrobe with the sweater to make it even more useful. We are currently experiencing another (!!) snowfall and I think it will get a lot of use over the next couple of weeks. The snow is wet and heavy, in large part I think because the temperatures are milder and oh right, It’s March! but it’s cold and gets into your bones. Even with my down-filled winter jacket, it’s cold and I’m looking forward to layering this underneath to added warmth. Maybe this will become my go-to sweater in the cool mornings. Above: Charlotte peeking out at the snow and probably wondering what I’m doing! I’m looking forward to wearing this as part of my daily uniform – thus far, I’ve had it on for about 2 hours and no itching yet! I read somewhere recently that cutting off the tips of most fleeces (even Merino) can help with the itch factor, so I’m thinking about that as I look forward to continuing to process from raw fleece I received recently from my friend Katrina. It’s not enough for a sweater but certainly for a shawl. Until next time, I hope you’re staying warm in this weird weather we are having! I love how this sweater turned out. After watching your progress with this project, I bought the pattern, and I hope to be able to spin for it eventually. Thank you! I’ll be interested to follow your progress as you make yours. A friend here is doing for it now and it’s fun to now watch her progress! What an accomplishment! This is absolutely stunning. The yarn, the knitting, the design are all perfect. Congratulations on a an amazing sweater!! Well done, Rachel! I so admire your hand spinning consistency and tenacity. A sweater’s worth of yarn is a huge goal for me and it’s so lovely to see you reach that milestone time and again so effortlessly. Thanks for sharing all of your work! Thank you Melissa! This one was nice because it was “only” 800 yards of finished yarn. 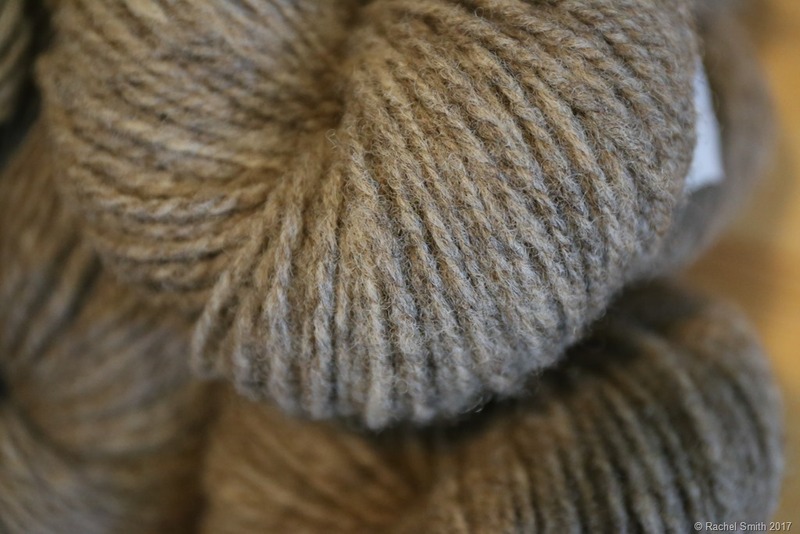 Some of these Aran weight sweaters make spinning for a sweater more attainable! !